Nothing signals it’s getting warmer quite like pineapple coming into season. Its bright, cheery color, fragrant smell, and vibrant taste are like biting into a piece of sunshine. The health benefits of pineapple can’t be overstated — it can help with everything from immune support to preventing cancer — and it’s easy to add pineapple to your daily routine. Pineapples contain a variety of health-boosting vitamins and minerals, as well as the enzyme bromelain and the amino acid tryptophan. Together, these nutrients help improve the immune system and fight off a number of conditions. Just one serving of pineapple contains over 130 percent of the daily recommendation for vitamin C, a vitamin that helps keep the immune system healthy. It’s also an antioxidant that protects the body against free radicals that can lead to cancer, Alzheimer’s disease, Parkinson’s disease and other degenerative conditions. Pineapple helps reduce inflammation in the joints and muscles. The “relatively rare proteolytic enzyme,” bromelain, found in pineapple, helps break down proteins that can harm joints. Bromelain also helps reduce inflammation and can alleviate your arthritis pain. Pineapple contains high levels of tryptophan, the same amino acid in turkey that triggers sleepiness at Thanksgiving. Tryptophan aids the body in producing serotonin, one of our main “happy hormones.” Adding pineapple to your diet may help you fight depression or anxiety. With almost 75 percent of the daily recommendation for the mineral manganese, pineapple can help build bone strength. In a study from the Linus Pauling Institute, manganese and other trace minerals may help prevent osteoporosis in post-menopausal women. Research shows that pineapple can directly prevent cancers of the breast, throat and mouth. 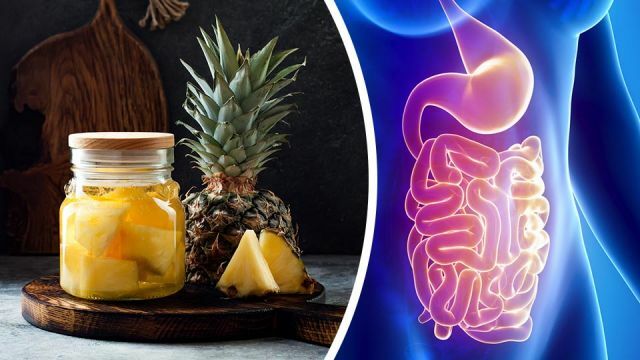 A study published in the British Journal of Cancer found that pineapple’s combination of bromelain, beta-carotene, vitamin A, manganese and a variety of flavonoid compounds can help prevent cancer among elderly subjects. According to the Mayo Clinic, the bromelain in pineapple can help improve digestion. The fruit’s high dietary fiber content aids in regularity and improves intestine health. It might even help you lose weight by reducing inflammation in the gut. Both the high content of bromelain and vitamin C in pineapples help prevent respiratory illnesses, but if you already have a cough or cold, pineapple can help clear your sinuses and reduce drainage. Check out our recipe for Pineapple and Honey Cough Syrup. One of my favorite ways to consume pineapple is to add it to a pitcher of water in my fridge. In the evening, simply cut up half a pineapple into chunks and add them to an empty pitcher. Fill the pitcher with filtered water and place in the refrigerator. In the morning, you’ll have pineapple-infused water for a fresh start to your day. You can even save the fruit for another recipe or to add to your morning smoothie. Replacing hamburger buns with grilled pineapple slices. Making a pineapple-based salsa with red bell peppers, purple onions, fresh cilantro, and lime juice. Adding diced pineapple to guacamole. Adding pineapple chunks and fresh mint to your oatmeal. Topping a hot dog with fresh pineapple, cilantro and cherry tomatoes. Drizzling pineapple syrup over homemade pancakes or Greek yogurt. Below are a few recipes for homemade pineapple-based health and beauty products. Enjoy a boost to your water or morning smoothie with a pineapple tincture. The concentrated amount of pineapple delivers a big punch in even small amounts. People with sensitivities to pineapple should dilute the tincture with a bit of water if taken as an immune booster. Add pineapple chunks to a large, clean jar. Fill the jar with vodka or apple cider vinegar. Use a butter knife to stir around the edge of the container and ensure all the air bubbles are broken. Seal the container. If using vodka, store in a cool, dark place. If using apple cider vinegar, store in the refrigerator. Shake the jar twice a day for 14 days. After 14 days, strain the tincture using cheesecloth or a fine sieve. Store in a tightly closed container in the pantry (for vodka) or the refrigerator (for apple cider vinegar). Infuse your hair with antioxidants and added moisture with this pineapple shampoo. The acidic properties of the fruit eliminate the need for an apple cider vinegar wash for those with dry or chemical-damaged hair. Place coconut milk, pineapple and olive oil (if desired) in a blender and blend until smooth. Add the blended ingredients to a clean container or recycled shampoo bottle. Gently shake the bottle before each use. One of the simplest ways to add pineapple to your beauty routine, this facial only requires a small piece of fresh pineapple and about ten minutes of your time. Start the facial off with rubbing the pineapple on your lips to exfoliate them. Five to ten minutes before your shower, rub the small piece of fresh pineapple all over your face. Allow it to dry. Take a shower as you normally would. The steam will give you a “mini steam,” and the warm water will wash all the pineapple juice off of your face. Moisturize as usual when done. This sweet treat will make you feel like you’re on an island vacation. Although you should enjoy it in moderation, it can make for a delicious dessert when drizzled over fresh berries and mango slices. Add pineapple chunks to a large bowl. Add 1 cup of sugar to the pineapple and stir to coat. Cover the bowl and place in the refrigerator overnight. The next day, make a simple syrup with the remaining 1 cup of sugar and 1/2 cup of water. Gently warm the ingredients in a saucepan until combined. Set aside. Add pineapple and all of the liquid in the bowl to a blender. Pulse to combine. Add the warm simple syrup to a blender and blend to combine. Strain the liquid into a bottle using a fine-mesh strainer or cheesecloth. Press the solids to extract as much liquid as possible. Store in a tightly closed container in the refrigerator. Bromelain is a meat-tenderizing enzyme, so make sure you don’t eat too much pineapple. An “overdose” of pineapple can lead to gastrointestinal issues like nausea, vomiting and diarrhea. Other people have experienced headaches as a result of over-indulging in this tropical fruit. Pregnant women should also avoid eating too much pineapple, as it is a menstruation stimulant. In some cases, too much pineapple might lead to miscarriage. Whether you eat pineapple for its health benefits or you just enjoy the taste, one thing’s for sure: it can keep you healthier and make you feel better. So why not give it a try? What’s your favorite way to eat pineapple? Let us know in the comments! Hey Buddy!, I found this information for you: "Pineapple Is In Season! 7 Reasons To Drink Pineapple-Infused Water Every Day". Here is the website link: https://www.thealternativedaily.com/7-reasons-to-drink-pineapple-infused-water-every-day/. Thank you.